I designed my irrigation system for 16gpm@70PSI. Many years ago I had a 1-inch meter with 1-inch service line. The city came around and replaced all the meters with new smart-meters. I believe at that time my 1-inch meter was replaced with 3/4 inch meter. I am using the stamp on top of meter for this indication. Will the smaller meter cause problems for the design above? Is it common to use smaller meters for 1-inch mains? Is it possible the meter body is 1-inch but the digital monitoring part is from 3/4 inch meter. I am having a terrible time fighting the city to get my correct meter put back. I have pictures of the meter and service line if that would be helpful. Did the sprinkler system stop working? All the pipes, valves, and controller have been installed. Last week I just finished installing RPZ. I am getting ready to start flushing system and installing heads. I was just curious if this kind of configuration is common. Due to pipe size and location, I wasn’t able to do a bucket test. I am using the theoretical 70% of ~28gpm=19.6gpm for 1” copper. I didn’t know how much impact a smaller meter would have on flow. I kept the design to 16gpm which translates into roughly 6, 360deg, Hunter MP heads, 25ft, 2.88gpm. meter is a false alarm. I didn't check the side of the meter nor looking for reducing bushings (1">3/4"). I can upload some picture if necessary. Since you do have a meter in place, there is absolutely no possible reason you can't perform a flow-and-pressure test, especially as most of these new meters are capable of displaying a flow number all on their own. I tried to setup a bucket test using some flexible PVC and metal clamp. For one-inch line, you cannot use anything from the big-box garden-isle. Measuring the amount of water was quite messy using a five-gallon bucket - water was splashing all over the place. I punted. What I am asking is the extra GPM worth all the hassle of fighting the city to put back a 1-inch meter? I showed them pictures of the service line, and they backed down. Is it normal for cities to install 3/4-inch meter on 1-inch service line? schedule 40) and then downgraded to 16GPM for smaller meter. Meters often come with different monthly charges, and bigger is always more costly. Trust me, you absolutely did not pay for perpetual usage of your 'lost' meter. Moreover, if you consult the pressure loss tables for various meter sizes, you will find that the flow rate of 16-18 gpm is a fine fit for a 3/4-inch meter. One of the most commonly followed standards for determining a water meter's peak operating safe flow is to not exceed 80% of the water meter's peak safe flow limitation. For a 1" water meter the peak flow limit is 50+/- GPM, therefore the peak safe flow limitation is going to be 40 GPM (not shown in table presented previously. At that rate (40+/- GPM the friction loss is going to be around 9.6 GPM. If the pressure on the upstream side of the water meter is less than 60+/- GPM, you might want to reduce your flow demand so that it does not exceed 10% of the pressure of the static pressure (on the service line, upstream of the meter. 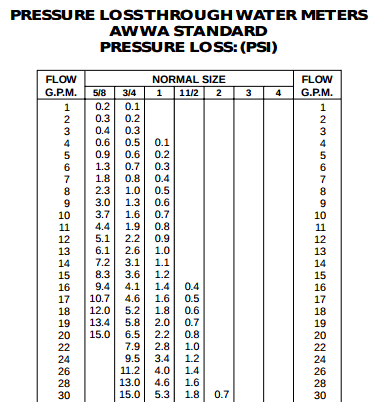 If the static pressure is 55+/- GPM, you do not want for your peak flow demand to cause a 5.5 PSI friction (pressure) loss, therefore, your peak flow should be restricted to 30+/- GPM - this is just an example, your 3/4" water meter should be fine with a flow demand around 18+/- GPM. lAST BUT NOT LEAST ... BEWARE OF THE FRICTION LOSSES ALSO INCURRED THROUGH A BACKFLOW PREVENTER IF YOU HAVE TO USE ONE, AND IF IT IS A REDUCED PRESSURE BACKFLOW PREVENTER.